Illuminated first page from a 1910 manuscript of the Rubáiyát. Photo by William Creswell. This quatrain is put on the walls of the Leiden Institute For Area Studies (LIAS) at Leiden University to enhance the buildings at M. de Vrieshof. The poem is one of the many quatrains attributed to the Persian astronomer and philosopher Omar Khayyam (c. 1048-1131) which inspired Edward FitzGerald (1809-1883) to make his adaptation, The Rubáiyát of Omar Khayyám in 1859. The authenticity of quatrains ascribed to Khayyam is a matter of contention as the majority of these poems are attributed to him in later centuries. FitzGerald’s adaptation of the Persian quatrains inspired generations of artists, poets, philosophers and politicians, who used the poems in a wide range of contexts. The quatrains possess an air of mystery. They are terse in contents, and witty in the universal wisdom they express, but also hedonistic in worldview, strongly propagating the carpe diem philosophy. It is this combination that has made the quatrains so popular for generations of readers in different cultures. FitzGerald’s rendering is unique in translated literature, inspiring more than a thousand poets to prepare their own translations in various languages. The Rubáiyát became a cult in Europe and America at the turn of the twentieth century, and later in the rest of the world as well. The quatrain attributed to Omar Khayyam on the walls of the Leiden Institute For Area Studies (LIAS) at Leiden University. Photo by the author. More – more – please more – and that I am ever Gratefully and respectfully yours. The Rubáiyát ran to the fifth edition (1872, 1879), the final one was published posthumously in 1889. The vogue of the quatrains did not limit itself to literary circles, which produced a large number of imitations, parodies, commentaries, but also to material culture where individual quatrains were cited in commercial advertisements for tobacco, cigarettes, pencils, coffee, chocolate, perfume, toilet soap, wine, cafes, calendars, and many other objects. There are many reports about soldiers in both World Wars who kept copies of the Rubáiyát in their pockets and knew the quatrains by heart. Coumans gives 1015 editions of Edward FitzGerald’s translations in his recent bio-bibliography. It is amazing how these quatrains have reached such a sensational popularity. Paradoxically the sensation for the Rubáiyát even increased when it went down on board of the R.M.S. Titanic. One of the most lavished publications of a book is by Sangorski & Sutcliffe who worked on this edition for two and a half years. This was how The Great Omar – A Copy of The Rubáiyát of Omar Khayyám was created. The commissioner, John Stonehouse, had given the following instruction: “Do it and do it well; there is no limit, put what you like into the binding, charge what you like for it; the greater the price, the more I shall be pleased; provided only that it is understood, that what you do, and what you charge for, will be justified by the result; and the book when finished is to be the greatest modern binding in the world; these are the only instructions.” (Shepherds, 49) The binding contained thousands of jewels. The front board was adorned with three peacocks beneath a Persian arch, perching upon the “shape of a heart,” their tails made of inlaid jewels and gold, almost taking up the entire cover. “The eyes of the feathers were set with topazes, 97 in all, (…), the crests of the birds were decorated with 18 turquoises and their eyes were set with rubies.” (Shepherds, 53-56) The American Gabriel Weis purchased the book at an auction. Sotheby packed and sent the book to New York on the Titanic. Sadly the book now lies probably on the bottom of the Atlantic Ocean. 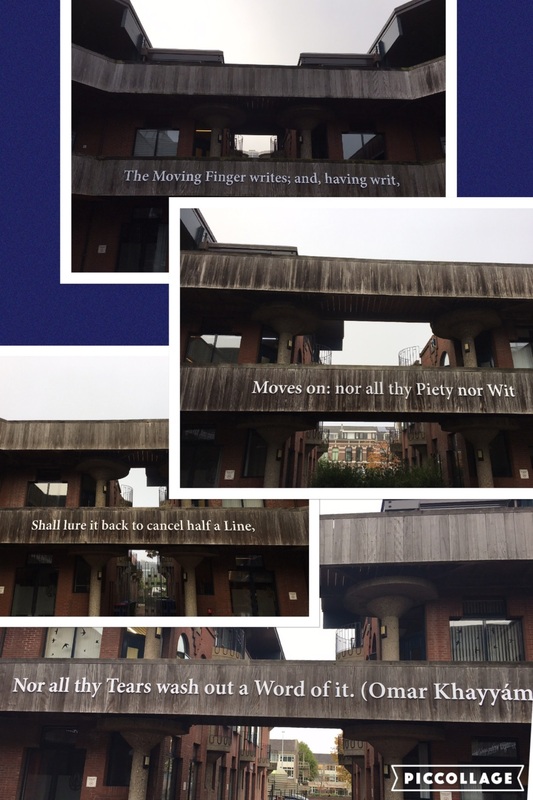 Going back to our quatrain “The Moving Finger,” it is one of the favourite poems in the English speaking world. A search on Google for “Omar the Moving Finger” offers 940.000 results, and searching only “the Moving Finger” yields to 74.000.000, pointing among others to Agatha Christie’s 1942 novel The Moving Finger. To my knowledge, the poem was used in the United States by Martin Luther King (1929-1968) and President Bill Clinton (Pr. 1993-2001). Martin Luther cites Omar Khayyam in his speech “Beyond Vietnam: A Time to Break Silence” in 1967 to refer to the inexorable passage of time, “We may cry out desperately for time to pause in her passage, but time is adamant to every plea and rushes on. Over the bleached bones and jumbled residues of numerous civilizations are written the pathetic words, ‘Too late.’ There is an invisible book of life that faithfully records our vigilance or our neglect. Omar Khayyam is right: ‘The moving finger writes, and having writ moves on.’” Clinton cited the quatrain during the Monica Lewinsky affair in 1998, “Like anyone who honestly faces the shame of wrongful conduct, I would give anything to go back and undo what I did. But one of the painful truths I have to live with is the reality that that is simply not possible.” Afterwards, he cites the quatrain. To give a Man excuse for being lit. When you can’t help yourself a single Bit." Not even if the Victims are Half Dead! Front page and picture from a 1906 edition of The Rubaiyat of a Motor Car by Carolyn Wells (Dodd, Mead and Company). Photos by Fadedpage.com (https://www.fadedpage.com/books/20160131/html.php). To conclude, FitzGerald has made Khayyam’s quatrains part of world literature, expressing how to live well, reminding us of our mortality, and why we should pluck the moment with a smile from the inexorable passage of time. Aminrazavi, M., The Wine of Wisdom: The Life, Poetry and Philosophy of Omar Khayyam. Oxford: Oneworld, 2005. Biegstraaten, J., “Omar with a Smile,” in Persica: Annual of the Dutch-Iranian Society, No. 20, 2004-2005, pp. 1-37. Coumans, J., The Rubáiyát of Omar Khayyám: An Updated Bibliography, Leiden: Leiden University Press, 2010. Karlin, D., FitzGerald Edward: Rubáiyát of Omar Khayyám, Oxford: Oxford University Press, 2009. Shepherd, R., The Cinderella of the Arts. A Short History of Sangorski & Sutcliff, London and New Castle, DE: Shepherds and Oak Knoll Press, 2015. © Asghar Seyed-Gohrab and Leiden Medievalists Blog, 2018. Unauthorised use and/or duplication of this material without express and written permission from this site’s author and/or owner is strictly prohibited. Excerpts and links may be used, provided that full and clear credit is given to Asghar Seyed-Gohrab and Leiden Medievalists Blog with appropriate and specific direction to the original content.